Hello all. I am attempting a couple of videos this month. I hope they work! I was flying home at 39000 feet and it was going to be dark by the time we landed. About 100 miles ahead of us we saw a line of thunderstorms between us and home. Our radar indicated we would be above the top of the storms, but it was quite a light show. The first video is from about 60 miles and then the second is closer to 30 miles and it has begun to get dark. It is quite a sight as you pass directly over the top and the lightning illuminates the entire sky below you! Mother nature is awesome!! Hope you enjoy. Video below is on a descent from approx 7500 feet as we flew into the clouds. The only time you get a real sensation of speed is when you are flying directly above the clouds. 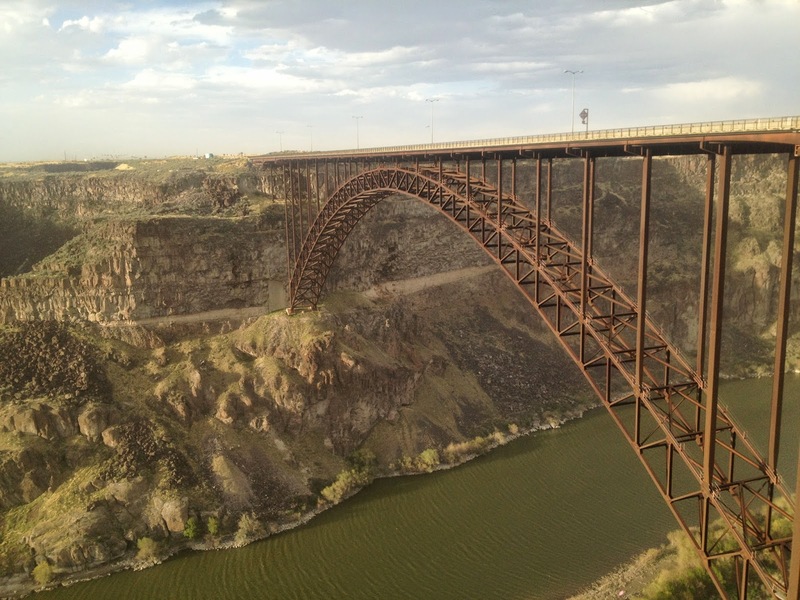 The Bridge over the Snake River, Twin Falls, Idaho. The river is 480 ft below! Robert E Lee, Stonewall Jackson, and Jefferson Davis carved into the granite monolith. full screen symbol on the right, it works. No Clue! I checked with Cat and she diagnosed the problem as my out of date browser. Thanks Cat, what would I do without you! You are very welcome George...so happy I could be of help. Thank you for sharing your awesome photography and videos with us! Wow, stunning photos George, love Stone Mountain! Unfortunately I seem to have trouble viewing videos on my tablet. Thanks for sharing the awesome pics! Hi Roz, sorry the video didn't work, but glad you enjoyed the pictures. Stone Mountain is really amazing and especially the history that has taken place there. Incredible videos! What worries me is that, well, aren't you meant to be paying attention to the flying?! LOL LOL! We had a horrible experience once when our pilot was attempting to land in Corfu during a mega thunderstorm. Lightening struck the aircraft as we went in to land, and we bounced and then went back up again. I am not a happy passenger - I hate being out of control. Even sometimes as a car passenger. I am presuming that each time a jet passes through thick cloud it has to rely solely on radar. Gasp. Thank goodness for gin and tonics! Ami, glad you made it on that landing in a thunderstorm. That is never a good idea! Actually, when we fly in the clouds (not thunderstorms, we use the radar to avoid thunderstorms) we just rely on our instruments. And as far as the picture taking goes, good co-pilots are a treasure! LOL Ami I thought the same thing! Love, love, LOVE the bridge photo! Hi Willie, That bridge is awesome! I am always amazed at the ability of engineers to design and the construction workers who actually build such marvels. And re pictures...sometime i do just let go for a moment and let the airplane fly on her own. She has never let me down!